2005 marked the 10th anniversary of the Dayton Peace Accords; a landmark agreement that stopped a war, but did not create a new country. Nation-building after such a divisive and painful conflict requires patient, on-going work. Legacy International is happy to have played a part in the effort since 2003. 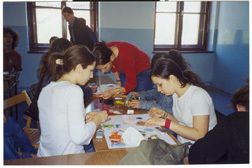 In partnership with the Bureau of Educational and Cultural Affairs of the U.S. Department of State and with the U.S. Embassy in Sarajevo, Legacy provided leadership training and civic education to emerging youth leaders from 6 cities in Bosnia and Herzegovina, representing all three of the nation’s ethnicities. 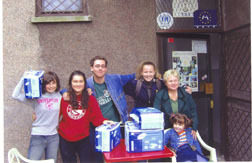 Participants hailed from Banja Luka and Prejidor in the Republic of Serbska, and Mostar, Travnik, Vitez, and Zenica. The project serves a need in the community in a constructive way. 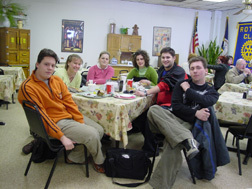 It involves everyone in the city group in selecting, planning, and completing. It is completed by August 1. Each member identifies and involves at least one additional volunteer in the project. The group from Banja Luka created a service project called “Children’s Rehabilitation Center,” which focused on providing companionship for children at “Dr. Miroslav Zatovic,” a residential children’s hospital near the city. They wanted to provide social interaction, help the young patients with their homework, teach them useful social skills, and generally make their stay at the hospital more pleasant. Many of the children in the hospital have disabilities or chronic situations that require long-term stays away from their families and friends. The participants planned to travel to the hospital each week during the project period, and spend time with the children. The idea for the “Children’s Rehabilitation Center” project was developed in the United States, and preceded any contact with the target hospital itself. The five YLP youths and their five volunteers were going to the hospital two per day, Monday – Friday. Initially, it was difficult to gain the trust of the children, many of whom have mental and behavioral problems as well as physical challenges. The YLP youths arranged some sessions with the Hospital Psychologist to receive training on how to understand the children’s needs and work more successfully with them. The children ranged in age from infant to early teen-age years. As the YLP youths gained the childrens’ trust, they began asking the children about what would make their stay in the hospital more pleasant. The children requested more age-appropriate books in the hospital library, a DVD player, and their own computer! The project team took on this challenge, and was successful in its fundraising efforts, receiving $1,077 in money and in-kind donations. The YLP youths made presentations with targeted requests to various commercial companies. They received 50 children’s books, 2 used computers, and funds to purchase a new DVD player. These were all presented to the children at the hospital at a special party. The YLP youths invited representatives from the supporting firms, and also arranged media coverage. The goal of the Mostar team’s project, “Workshop for Teens,” was to support reconciliation and co-existence efforts in their divided city by creating a “neutral environment” where teenagers could come together and spend time with each other. The venue was a series of arts and hand-crafts workshops, based on the idea was that an arts workshops would attract a different set of youths than would normally be willing to gather for pure socialization. Gaining permission to use a room at the Gymnasium for their workshops required several meetings with the principal. “We had to win her trust and prove to her that we were serious,” stated the project members. Then they learned that to use the building on a Saturday, a member of the building maintenance staff had to be present, and he had to be paid. This problem was solved creatively in conjunction with the Student Council, which had a small treasury, and was willing to make a small grant to the YLP group. School trips and school calendar changes affected the intended schedule for the workshops, but the group adjusted and found solutions as each challenge presented itself. In the end, they held 5 workshops and reached their target number of students. They were quite satisfied that their project had drawn together students from several schools in different parts of the city who normally would not have come into contact with each other. After considering several options, they decided to donate the remaining art materials to Nazaret, local home for children with special needs. The Zenica team proposed a multi-level project called “Ze Shock Radio – establishing a School Public Announcement system.” YLP participants wanted to reach out to the student body through “radio”- type programming on their school’s PA system (and other methods), in order to unite the student body and inspire students to become involved in service activities already available in the city. There were many useful projects already in operation in Zenica that needed more support; however, many high schools students seemed too passive or too disinterested to become involved. They found, however, that to make the PA system a useful tool, would require some unanticipated repairs. Nonetheless, the students persevered, and by using the existing PA system, giving small presentations in classrooms, hanging posters, and through word of mouth, the five team members recruited 20 additional peers. Each of the 25 students then committed to a two-month volunteer assignment with a local NGO called “Ruhama,” which provides medical, hygienic, and social services to house-bound, bed-ridden Seniors over the age of 60. Each volunteer had one or more “clients” whom they visited twice a week. They brought medicines from Ruhama, made tea and conversation, did simple grocery shopping, or offered their help in any way needed.